Other names: Baddanno, desert date. Kullan. Hankalta is a lesser known fruit from Africa and Middle East. 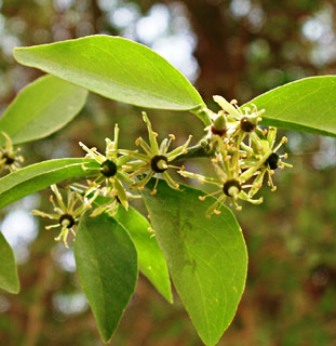 It grows widely in the in the Sudano-Sahielian region of Africa, the Middle East. 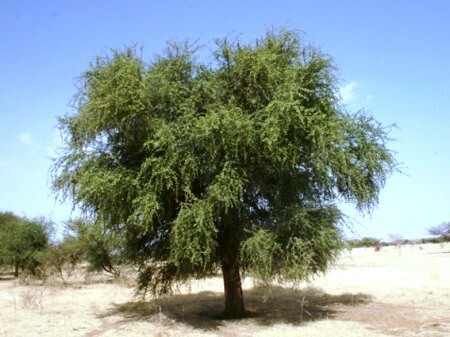 It is one of very common trees in Senegal. It can be seen growing in many kinds of habitat tolerating a wide variety of soils ranging from sand to heavy clay. Similarly it can also withstand a wide variety of climatic moisture levels. 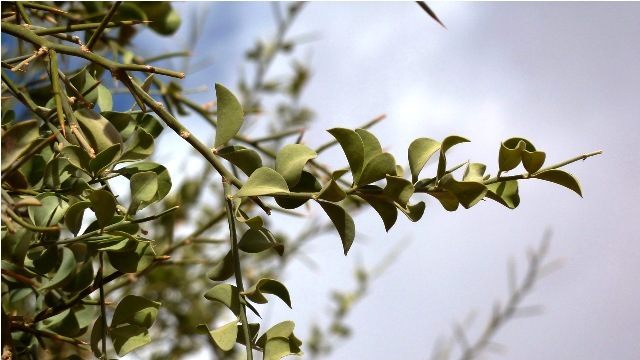 A mutibranched, spiny shrub or tree up to 10 m.
Leaves alternate, bifoliate, petioles 3-6 mm long, leaflets elliptic and having broadly pointed petioles up to 5 mm long; spines simple, straight, stout, rigid, green, alternate, supraaxillary, up to 5 cm long. Inflorescence supraaxillary clusters or rarely supracemose; flowers small, bisexual, greenish white, fragrant, in axillary clusters, few or many in number, cymes or fascicles; sepals 5, free, ovate, 3 mm long; petals 5, two free, oblong-obovate, longer than the sepals; stamens 10, filaments glabrous, anthers dorsifixed; ovary ovoid, silky, five-celled, ovules solitary in each cell, style short and conical. Fruit is an ovoid drupe, 2-5.6 cm long, borne on a short thick stalk, faintly five grooved; ripe fruit is brown or pale brown with a brittle coat enclosing a brown or brown-green sticky pulp. The ripe fruits, which taste bitter sweet, are popularly eaten by children. Adults also eat these during the periods of food shortages. The fruit is rich in vitamin A (~100mg/100gr). Concerning carbohydrates, the kernel of B. aegyptiaca has a calorific range of 514kcal/100gr to 567kcal/100gr. The pulp of the fruits contains on average 10.9% moisture, 2.7% ash, 1.4% protein, 0.29% oil, 36% sugars, 18% alcohol-insoluble solids, 93mg/100mg calcium, 15mg/100mg iron, 57mg/100mg phosphorus. New shoots and leaves, which are tender and succulent, are also cooked and eaten like cabbage by people during the periods of shortages. The seed, which is oily containing upto 40 per cent oil, is boiled and eaten with sorghum. 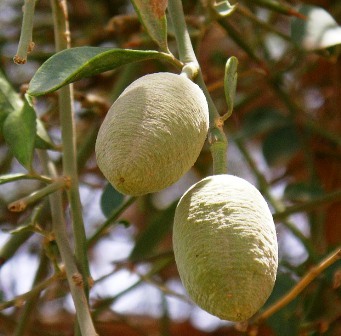 Hankalta trees are grown for its fruit in plantations in several areas of Africa. These are usually planted along the irrigation canals. Propagation is by seed only.